Located south of the Loop and right on the lake shore, Hyde Park is home to both the University of Chicago and some thriving and diverse residential communities. There’s never a lack of culture and night life, and lately there’s been a burst of new growth and businesses. When you’re moving to Hyde Park, you could head to a brand new high-rise or a classic family home, and you’ll never be far from something worth doing. As your Hyde Park movers, we’re happy to help you get there. Just over 25,000 people live in Hyde Park. It’s one of the most diverse neighborhoods in Chicago, with a wide spread of races, ethnicities, and ages. About a fourth of Hyde Park residents live in family units, while another half live as singles. Average household income in Hyde Park is around $60k. In the mid-19th century, the Hyde Park area started to become a vacation site for upper class Chicagoans. It continued to develop over the following decades, as upscale hotels were established. Through the 20th century, the neighborhood became more residential, and eventually became home to a large African American community. 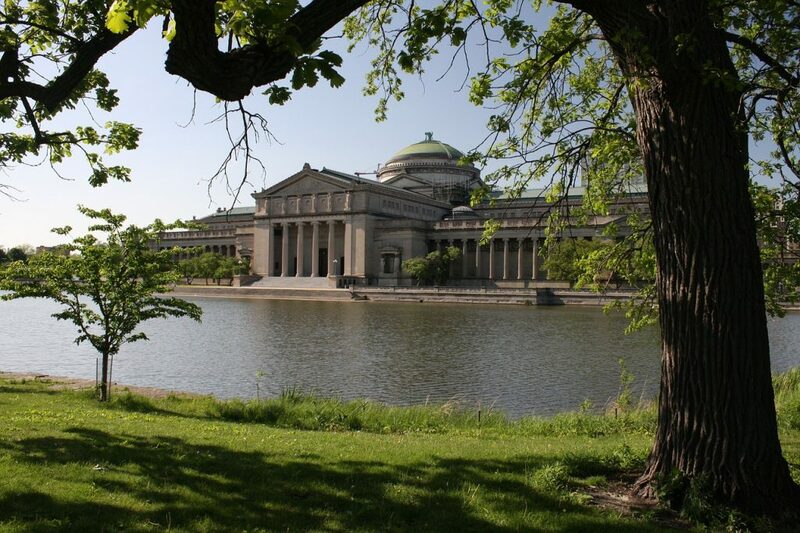 Hyde Park also housed the Chicago World’s Fair in the 1890s: one structure still stands, the Museum of Science and Industry (pictured above). Now you’ve got the gist, here are some highlights—and basics—we found to help you start your best North Park life. Midway Plaisance Park: Ice rink, gardens, and playing fields. Nichols Park: Gym, play areas, and programming. Museum of Science and Industry: World famous. Promontory Point: Scenic peninsula in Burnham Park. Court Theater: New and classic works. Hyde Park-Kenwood Community Conference: Events and updates. Pizza: Pizza Capri. Unique thin-crust pies. Delivers. Italian: Piccolo Mondo. Sit-down space with market. Carribean: Uncle Joe’s Jerk Chicken. Seafood, too. Middle Eastern: Nile Restaurant. Has a patio. Brunch: Medici on 57th. UofC institution with other meals, too. Comfort Food: Valois Restaurant. Counter service, cash only. Diner: Salonica Restaurant. With a Greek flavor. Also delivers. Beer: The Cove Lounge. Wide selection and great specials. Cocktails: The Promontory. With restaurant and music venue. Hangout: The Pub. Bar games in basement on U of C campus. Local: Woodlawn Tap. Cash only. Drive: The Falcon Inn. Low prices, great kitchen. Cash only. Whole Foods: Fresh and prepared foods. Treasure Island Foods: European-style chain. Hyde Park Produce Market: Family owned, ready-made meals. Cafe 53: Sandwiches, cafe staples, and wi-fi. Plein Air Cafe: Simple and bright. On campus. This has been a tiny sampling of the great things you’ll experience at your new Hyde Park home. As a seasoned Hyde Park moving company, we’ve learned all about the staples and cool places in the area. We’re happy to share more! As you’re planning your big move, cross one major thing off your to-do list, and book Hyde Park movers who’ll a take load of stress off your mind. Call us at New City Moving, and we’ll help you move safely, smoothly, and on-schedule, so you can settle right in and start living your greatest Hyde Park life.